A coffered ceiling has beams arranged in an appealing geometric pattern that give the ceiling a recessed appearance. Today most coffers are hollow and crafted from veneer, particleboard or plastic. These lightweight materials allow coffered ceilings to be installed with little preparation and at an affordable cost. Before you can decide which type of coffered beams to buy, you should lay out your design on graph paper. This will allow you to visualize the finished ceiling before you begin the project. Keep in mind that adding textured finishes to the ceiling may enhance the use of coffered beams. Pre-fabricated coffered beams come in many widths and heights. Coffered beams will reduce the amount of light reflected back into a room and can make a room appear smaller. Using a thinner beam will reduce this affect and still produce the desired results. Many companies manufacture these ceiling kits to your room and personal specifications. These kits vary in price and complexity. Ornate moldings and drop down ornamentation can produce a ceiling reminiscent of the ancient Greek or the Gothic period in European architecture. Simple coffered beams produce a ceiling with a rustic hand-hewn beam appearance and are less expensive than the ornately carved coffer beams and trim. Before you begin attaching the supports for the coffered beams, the ceiling should be painted if needed. It is easier to paint and or texture a ceiling before installing the beams. 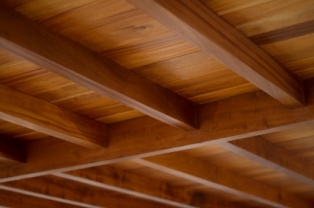 Be sure to allow the ceiling to dry completely before installing the coffered beams. Textured ceilings can add a depth to coffered beams. Drywall mud is applied to the ceiling and then using sponges, bristled brushes, trowels or hands a texture is created. A thin coating provides for a light texture while a thicker coating will provide the material for deep textures. Once completely dry, the textured ceiling can be painted. Drywall mud is available in muted colors allowing for the creation of textured ceilings that do not require painting. These ceilings require support. The easiest way to install hollow coffer beams is to place a wood support strip on the ceiling. The hollow beam is then nailed to this support on both sides providing adequate support. It is recommended that you place the center beams up first. This allows for any adjustments due to un-level ceilings to be made during installing. Adjustments made on the outer edges of the ceiling will not be visible. Center beams that are not aligned will be visible. After the coffered beams are installed, trim boards will be added to help cover any imperfections and add a finishing touch. Wide trim will produce a deeper recessed look than thin trim will. Trim boards should be finished to match or accent the coffered beams prior to installation. Using glue and finishing nails ensures that the coffered ceiling will last for many years. Coffered beams are a way to enhance any rooms décor. Adding a rustic touch or an ornate sense of elegance can both be achieved by installing a coffered ceiling. Return From Coffered Ceiling page back to sitemap. Return From Coffered Ceiling to Finishcarpentryhelp - Home page.